Optical micrographs of severe corrosion on steel alloy samples exposed to ethanol and acetic acid vapors—conditions typical of underground gas storage tanks—after 355 hours, 643 hours, and 932 hours. A hidden hazard may lurk*** beneath many of the roughly 156,000 gas stations across the United States. The hazard is corrosion in parts of underground gas storage tanks—corrosion that could result in failures, leaks and contamination of groundwater, a source of drinking water. In recent years, field inspectors in nine states have reported many rapidly corroding gas storage tank components such as sump pumps. These incidents are generally associated with use of gasoline-ethanol blends and the presence of bacteria, Acetobacter aceti, which convert ethanol to acetic acid, a component of vinegar. A NIST study found that corrosion may pose a hazard at underground gas storage tanks at filling stations. The study focused on sump pump components, especially the pump casings (labeled #3 in graphic), which are typically made of steel or cast iron. Following up on the inspectors' findings, a National Institute of Standards and Technology (NIST) laboratory study* has demonstrated severe corrosion—rapidly eating through 1 millimeter of wall thickness per year—on steel alloy samples exposed to ethanol and acetic acid vapors. Based on this finding, NIST researchers suggest gas stations may need to replace submersible pump casings, typically made of steel or cast iron, sooner than expected. Such retrofits could cost an estimated $1,500 to $2,500 each, and there are more than 500,000 underground gas storage tanks around the country. The NIST study focused only on sump pump components, located directly below access covers at filling stations, just above and connected to underground gas storage tanks. 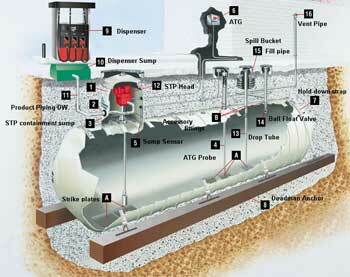 The sump pumps move fuel from underground tanks to the fuel dispensers that pump gas into cars. These underground tanks and pipes also may be made of steel and could be vulnerable, too. "We know there are corrosion issues associated with the inside of some tanks. We're not sure, at this point, if that type of corrosion is caused by the bacteria," NIST co-author Jeffrey Sowards says. For the latest study, NIST researchers developed new test methods and equipment to study copper and steel alloy samples either immersed in ethanol-water solutions inoculated with bacteria, or exposed to the vapors above the medium—conditions mimicking those around sump pumps. Corrosion rates were measured over about 30 days. The NIST study confirmed damage similar to that seen on sump pumps by field inspectors. The worst damage, with flaky iron oxide products covering corrosion, was found on steel exposed to the vapors. Copper in both the liquid and vapor environments also sustained damage, but corrosion rates were slower. Steel corroded very slowly while immersed in the liquid mixture; the NIST paper suggests bacteria may have created a biofilm that was protective in this case. Although copper corroded slowly—it would take about 15 years for 1.2-millimeter-thick copper tube walls to develop holes—localized corrosion was observed on cold-worked copper, the material used in sump pump tubing, NIST co-author Elisabeth Mansfield notes. Therefore, stress-corrosion cracking is a concern for bent copper tubing because it would greatly reduce tube lifetime and result in leaks. The NIST test equipment developed for the study could be used in future investigations of special coatings and biocides or other ways to prevent sump pump failures and leaks. NIST held a workshop in July 2013 on biocorrosion associated with alternative fuels. Presentations and information from this workshop can be found online. *J.W. Sowards and E. Mansfield. Corrosion of copper and steel alloys in a simulated underground storage tank sump environment containing acid producing bacteria. Corrosion Science. July, 2014. In press, corrected proof available online. DOI: 10.1016/j.corsci.2014.07.009. **See 2011 NIST Tech Beat article, "NIST Finds That Ethanol-Loving Bacteria Accelerate Cracking of Pipeline Steels."